Posted April 20, 2019, 10:34 a.m.
Two Brazilian bands, Deafkids and Rakta, have joined forces for a collaborative two-song EP. 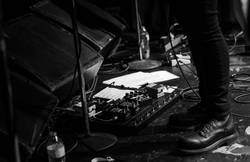 The bands are currently on tour together as well, on a European trek that kicked off following Roadburn. Deafkids last released Metaprogramação (Neurot Recordings). 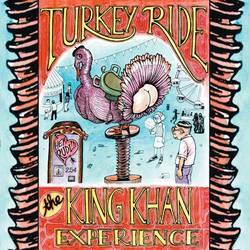 On May 24, The King Khan Experience will release Turkey Ride, a collection of eighteen year-odl recordings that saw very limited release originally. The new/old record comes out on Khannibalism/Ernest Jenning Record Co. The King Khan Experience was a solo project of namesake King Khan and was recorded when he lived in Bordeaux and Berlin. Sophie Crumb provided the artwork, and the album includes a German-language Jay Reatard cover, and 12 other tracks. King Khan - vox, guitar, bass Dan Ra Guerrezowsky - Fender Rhodes, organ, backup vox Spocko la Palma - drums, flute, banjo Decheman - guitar, lap Steel, sitar, organ Fredovitch - organ, sitar, piano, drums Francois - bass Chris Fuzz - drums Big Fred Roller - baritone N.D. Ray, Preslisa, Lilia Nentwig - backup vox Kib Husk - drums on "Are You Serious" Bella - vox on "Hammer Ich Vermisse Dich"
Posted April 14, 2019, 11:31 a.m.
Posted April 14, 2019, 11:01 a.m.
Posted April 14, 2019, 10:30 a.m.